For my birthday my mother gave me a gift certificate to Beadworld and a box full of jewelry making tools. I rushed over to the bead shop and signed up for my first class. While over there, I picked out beads for my first two projects. Without even knowing it, I designed a very popular style that is time tested: the chain dangly earring (see Wire 1: Part 2). Instead of just ending the chain in beads, I worked up the chain with several beads. 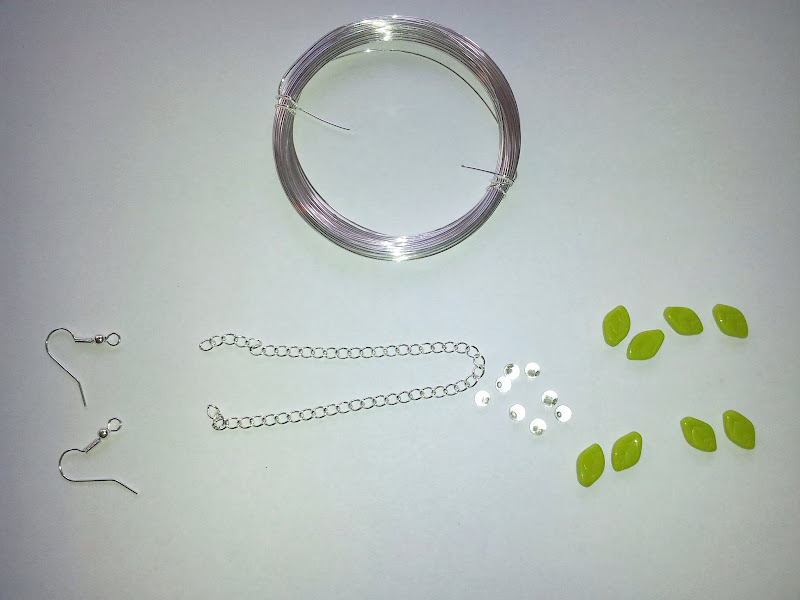 Supply list: wire, chain, beads and earhooks. These green leaf beads require a different strategy then what I learned in my first wire class. They are top drilled, instead of being drilled all the way through the center. We learn the wire wrapped loop technique in the Wire 2 class (tutorial upcoming!). This technique is good for more delicate beads and top drilled beads. 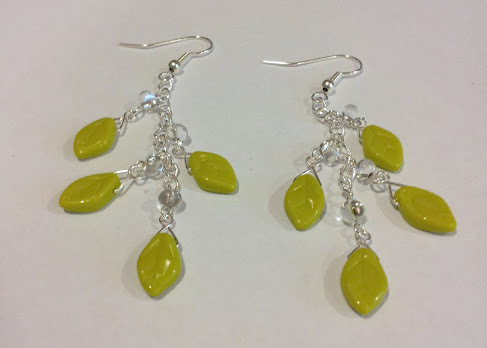 I was eager to make these earrings, though, and made the purchase any ways. Here is how I made them. Step 1: String the bead onto the wire and bend the stem and tail up over the bead so they crisscross each other. Step 2: Trim the excess tail so that it is flush with the stem. Step 3: Make your basic loop (click for a tutorial!) with the stem by bending the stem over your needle-nose pliers and rotating the loop, and trimming. Step 4: Next make a double beaded eye pin (click for a tutorial!) with the silver/glass bead. Thread one end into the eye of the green leaf and the other end into the last loop of the chain. 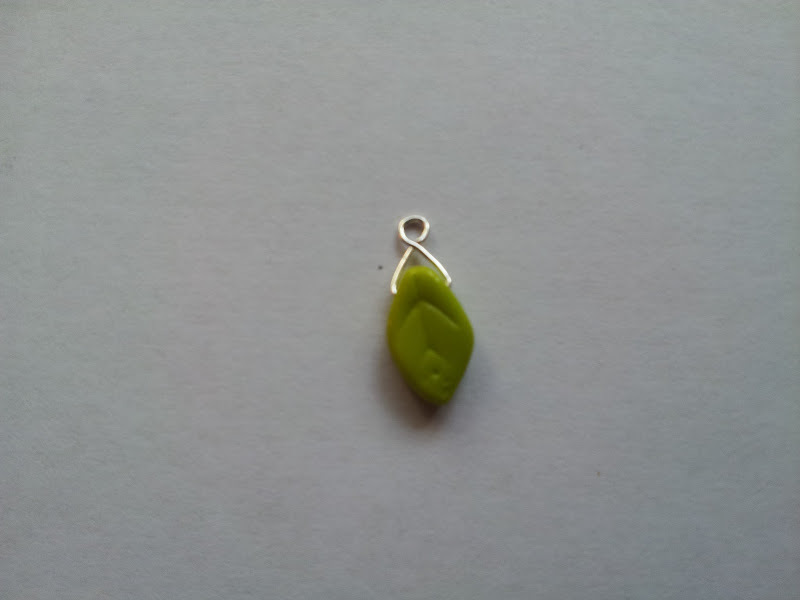 Step 5: Repeat steps 1-4 for the other three pairs of beads, stringing each set such that the bottom of the leaf overlaps the glass bead below it, and the bottom of the green leaf just barely touches the top of the green leaf below it. Alternate which side of the chain the bead combo is attached to. Step 6: Repeat steps 1-5 for the second pair of earrings, attaching the beads to the other end of the earring chain. Step 7: Cut the chain to the desired length attach earhooks. Check out my Google+ album for a few more pictures. 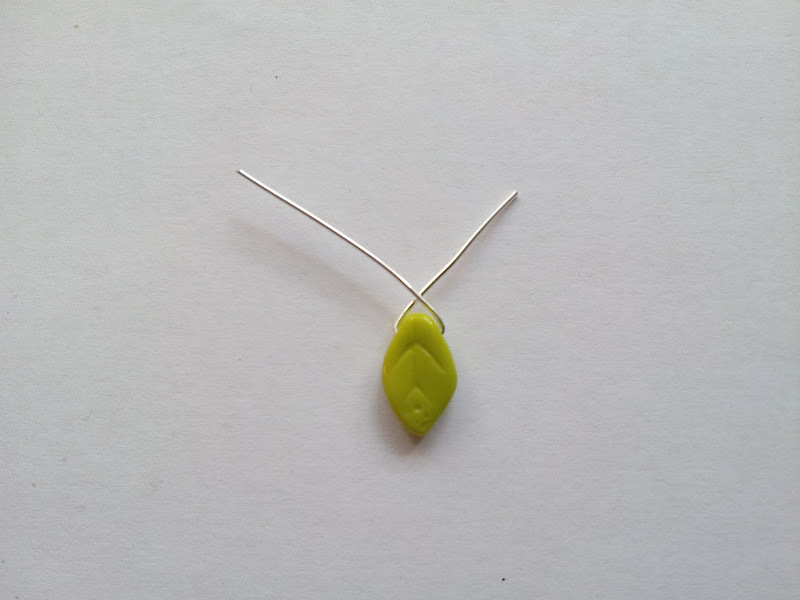 This is a really a simple design that can be used for any number of beads and combinations. 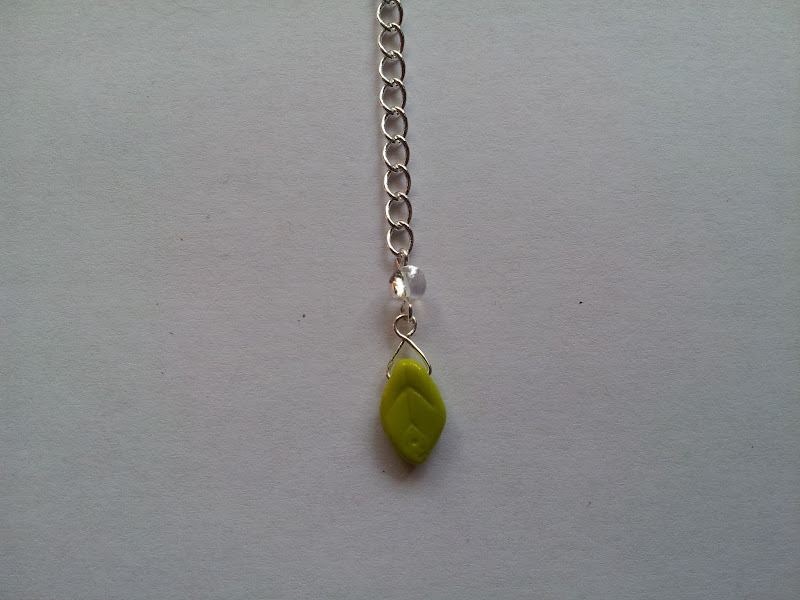 I've also made a matching necklace! Check out below for some similar projects. For more inspiration, check out Pinterest and Fusion Beads. Hi, I'm Bethany Steadman! I blog about Life, Family and everything between. Want to learn more about me? Thank you for reading my blog. Don't forget to follow me and/or subscribe to receive post updates. Check out my Project Gallery for more inspiration. I would like to give a special thank you to my blog community. Also a shout out to Little Vintage Camera for the chevron background. All content on this blog is created by Bethany Steadman unless otherwise stated. All rights are reserved to their proper owners. Please feel free to share a link to this site, perhaps share a picture and/or review the content on this site. Please do NOT reproduce any post in full without explicit permission. Doing so infringes on the rights of the content owner. I love social media. Please feel free to share any picture from this site on any social media site. Please do NOT alter the image or alter the context of the photos. Especially if the photos include pictures of my family. Thank you for respecting my wishes. I look forward to developing a relationship with you! © 2015 Bethany Steadman of Making My Steadl. All Rights Reserved. Powered by Blogger.